My Mum got an orange roan puppy 3 weeks ago and it is now 13 weeks old. At first she let her sleep in the same room with her but as my mum has a terrible cold (more like flu) she feels it would be better for the puppy to sleep in the kitchen. My mum lives in an flat/apartment over one floor. She spends a lot of time in the kitchen as it is large and there is a television and radio in it, so the puppy is used to spending time in there with my mum - just not good at being left alone! The puppy howls, whines, and cries very loudly! My mum just feels like she cannot get to be on her own at all without the puppy wanting to be round her ankles, on her lap, with her full stop. Do you have any advice for her please? Also, she has had the really bad sinus cold since getting the puppy and we all fear she could be allergic (we really don't think so, but this is adding to my mum's pressure). She loves the puppy dearly and hates feeling frustrated - my dad died 4 months ago, so she is lonely and needs the company - she wants to make it work with the puppy but at the moment feels that the puppy is controlling her rather than the other way around. Sorry for such a lengthy question!! It sounds like you and your mum are having a rough time - I'm very sorry for your loss of your father. As for your puppy's separation anxiety, well, that can be dealt with in a structured manner. You may not be able to completely remove your puppy's anxiety about being left on his own, but you should be able to go some way towards it. My first recommendation would be for your puppy to be crated - don't worry, it's not cruel. What a crate will do for your puppy is it will give her a 'place of his own' where she feels safe and, when she's inside her crate, your mum won't need to worry about the puppy snapping around her heels. Place the crate in the kitchen where the pup can see your mum and what's going on generally. You can learn how to crate train your puppy here. I recommend you begin to leave your pup in the kitchen on her own for a minute or two. Nip out into another room and then return. Gradually increase the length of time you stay out of the room. Don't make a fuss when you leave or when you return. Practice leaving the room and returning frequently and it will teach your puppy that you (or your mum) always return, so she's not really got anything to worry about. Rather than repeat myself, you can find lots of helpful information and advice on how to manage your dog's separation anxiety here. Work through each stage carefully and slowly and you will get there. I also recommend that you try to wean your puppy away from sleeping in your mum's bedroom if possible. You can read more about sleeping arrangements for dogs in my article Let Sleeping Dogs Lie - But Not On Your Bed! I'm not surprised your puppy is crying all day. 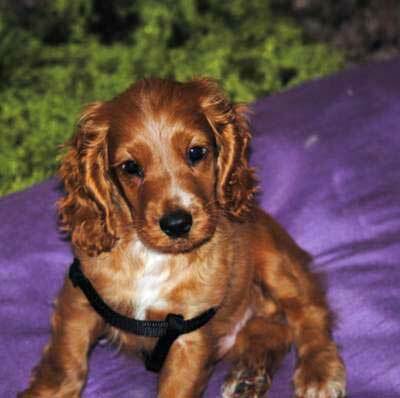 Cockers don't like to be left alone at the best of times, but your puppy will also be missing his mother and littermates - he's so young. I understand that you both need to work, but 8 weeks is a little young for a puppy to be left on it's own all day. I appreciate you've left him food and water, and he's safe, but puppies need to be fed at regular intervals during the day, not all at once and they need to be cared for, played with, exercised, and given lots of cuddles. And who's is training and socializing him during this time? I believe there's only 4 weeks left to socialize your puppy properly, otherwise you may end up with a jittery, scared, nervous dog. Isn't there anyone you could ask to puppy sit until your puppy is a little older? I'm sorry if I sound like I'm 'having a go at you', I'm not, I do appreciate that you've got to work. I just can't bear the thought of your puppy being left alone all day. Hey all! Our Cocker Spaniel is now 8 weeks old and we are stuck in the same situation. As my husband and I both work during the day, she has to spend the day outside (with enough food, fresh water and shade). The problem is that as soon as we put her outside she starts barking and wailing, and it doesn't stop until we get home. Is there any way we can get her used to being outside? Please help - we are at our wits end!